How I love to go out hunting on a bright Sunday morning—though it’s not my style to shoot furry/feathery/finny animals. My game is to get up early and stalk a wily factoid. The concept here seemed familiar, but the term “Lincoln Index” was new to me. Lincoln who? What index? So we’re talking ecology and population biology. The original idea was not to catch the same typo twice but to catch the same furry/feathery/finny creature twice. Interesting. However, the first couple of web pages that Google sent me to (here and here) told me nothing about Lincoln. And, oddly, I found no Wikipedia entry for “Lincoln Index.” If it’s not in Wikipedia, does it exist? With a little more poking around, I stumbled upon another clue that seemed promising: a mention of “the Lincoln-Pearson equation for estimating population size.” I was still in the dark about Lincoln, but Pearson is quite a familiar figure. Surely that’s Karl Pearson, the pioneering statistician, who did much of his work in the biological sciences and might very well have come up with a scheme for estimating population sizes. Back at Google, though, searching for “Lincoln-Pearson” turned up nothing pertinent other than the page I’d come from (though I did learn that Karl Pearson “read in chambers in Lincoln’s Inn” during his early years studying law). Petersen, C. G. J. 1896. The yearly immigration of young plaice into the Limfjord from the German Sea. Report of the Danish Biological Station to the Home Department 6:1–48. Petersen’s report is available online, scanned from a copy belonging to the library of the Marine Biological Laboratory and Woods Hole Oceanographic Institution, and hosted by the Biodiversity Heritage Library of the Internet Archive. A second surprise: The report is written in English. But on reading through it I find only vague and murky connections between the work Petersen reports and the mark-recapture method of estimating populations. There’s nothing resembling the E1E2/S formula. Petersen does describe a series of capture/mark/recapture experiments. A few hundred plaice were caught and marked by attaching numbered buttons, then put back in the water. Fishermen who recaught the labeled fish in later months were asked to report them. But the purpose of this study was not to estimate the total population; instead, Petersen used before-and-after measurements of the marked fish to estimate their growth rate. In a much larger experiment, some 82,580 plaice (somebody must have counted them!) were transplanted into the fjord, and 10,900 of the fish were marked by having a hole punched in their dorsal fin. The number of marked fish was recorded as the plaice were caught during the coming year. It’s not clear whether the aim of this project was to estimate the total population, but in any case it didn’t work. The fraction of marked fish in the transplanted batch was about 1/7, but the marked fraction in the subsequent catches was 1/5. Petersen remarks, “This result is very strange,” and I have to agree. When Petersen did try to estimate the plaice population, he didn’t rely on a recapture scheme. He went out with seine nets designed to dredge up every bottom fish in a measured plot, then extrapolated from the density of fish per unit area. The whole report is fascinating fishy stuff, but it leaves me wondering just how Petersen came to be given credit for the resampling idea. As far as I can tell, it’s not to be found in this paper. Lincoln, F. C. 1930. Calculating waterfowl abundance on the basis of banding returns. United States Department of Agriculture Circular 118:1–4. The author was Frederick C. Lincoln, who was bird-bander-in-chief in the U.S. for some 25 years. 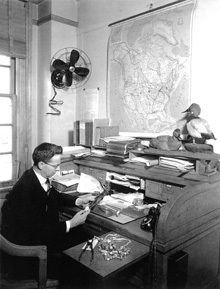 The agency he founded has since migrated from the Department of Agriculture to the U.S. Geological Survey and become the Bird Banding Laboratory. Google returns hundreds of works that cite Lincoln’s paper (including some quite far afield from population biology). But tracking down the USDA document itself was not so easy. If the USDA has it online, I wasn’t able to locate it. But a search of WorldCat eventually turned up an archive in the Hathi Trust Digital Library where you can page through Lincoln’s pamphlet in a copy scanned by Google at the University of Minnesota library. If in one season 5,000 ducks were banded and yielded 600 first-season returns, or 12 percent, and if during that same season the total number of ducks killed and reported by sportsmen was about 5,000,000, then this number would be equivalent to approximately 12 per cent of the waterfowl population for that year, which would be about 42,000,000. So that’s my reward for a morning spent out hunting: 42 million typos. Does Frederick Lincoln deserve credit for the Lincoln Index? I’d say he has a good claim, except that Pierre Simon de Laplace had the same idea more than a century earlier. In 1802 Laplace applied his method to estimating the (human) population of France. But maybe that’s a story for another Sunday morning. Epilogue. This is not really a story about typos, or about fish and ducks. It’s about finding things—about the phenomenal ease of chasing facts on the world wide web. Does a marked fish have any hope of escaping recapture there? Unfortunately yes. I was trying to recover the lyrics of a song I learned about the U.S. Presidents as a kid, to the tune of “Yankee Doodle”. There are a few very different versions on line, but the one that I recognize goes only up through Grover Cleveland, yet I remember it through Eisenhower. The rest is apparently lost, at least until someone bothers to put it online. I don’t know about the population estimate, but the point you’re trying to make at the end about this being a simple calculation that obviously recovers the total number of errors is wrong. I think you must be thinking of the inclusion/exclusion principle. 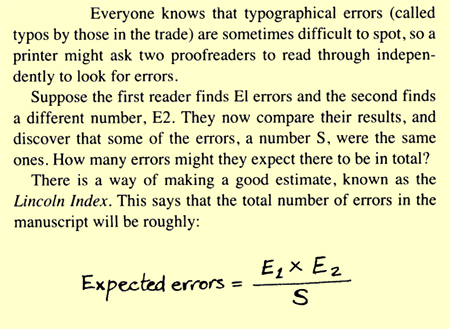 Assuming that the two copyreaders find all the errors between them, the total errors will be exactly E1+E2-S. There’s no reason for multiplication or division to come into this. Ironically, there’s a typo in your article’s penultimate paragraph: the sentence “I’d say he has a good claim, except that Pierre Simon de Laplace more than a century earlier.” is incomplete. Thanks for another entertaining post! Interesting article. I wonder how well this kind of thing could apply to software quality results (and in particular for my interests, security vulnerabilities). I.e. if Lincoln finds E1 defects and Petersen finds E2 defects, with S in common, can we safely assume that there are E1E2/S defects? I don’t think so, because testing for vulnerabilities is generally not a simple random sampling mechanism. Much depends on the method used for testing - static analysis versus fuzzing versus manual inspection or grey-box testing for example. Certain testing methods will typically only find certain classes of vulnerabilities for example, and with varying degrees of effectiveness. Fuzzing (pseudo-random input with varying degrees of structure) might be very good at uncovering buffer overflows and other parsing or data-plane/semantic-boundary transition problems, but it typically doesn’t do as well at identifying privilege or permission bypass issues. On the other hand, if you had two different teams fuzzing your firewall for example, and they came up with different results with some subset of identical results, it might make sense to apply the Lincoln index and estimate the total number of defects that could eventually be discovered by fuzzing, since fuzzing is essentially a random selection process. The other interesting thing about fuzzing is that it tends to be subject to diminishing returns, so you might also be able to estimate the total “findable” number from the decline in the rate of identification. So perhaps the most useful upper bound would be to take E1 and E2 to be the rate-adjusted total-findable estimates (instead of the currently identified count) for the two different teams. @Greg Wilson: Thanks for catching that. It was not a planted test for proofreaders. @John Cowan: The whole world is counting on you to fill in that last missing piece of the community memory bank! That’s the question raised in the blog posting by Mat Roberts that launched all this. Of course! Piercings. How could I have missed the obvious? Okay, but what about three or more samples? I suppose the limit is catch-and-release fishing, when you could unluckily catch the same fish over and over again. Suppose that two editors, Jack and Jill, independently read a long newspaper article supplied by one of their journalists. Jack finds A typing errors, whilst Jill finds B typing errors. They compare copies and discover that they both found the same error on C occasions. How many errors do you expect to remain, unfound, in the article? I was first struck by the ease of finding things out on the web a few years ago, while working on a physics assignment in college with my apartment-mate. We were sitting in my room, me at my computer, when he asked what the half life of a particular isotope of molybdenum was, and I entered it directly into a url prefixed with “en.wikipedia.org/wiki/”. Our conversation then turned to how I couldn’t have found the answer faster had he handed me a book and told me what page to look on, let alone if we had needed to go to a library or arrange for a reference to be sent from another library! How can we find the expected number of defects when there are more than 2 tester? The simplicity of the arithmetic hides the complications of doing data collection well. The Petersen and Seber estimators assume (1) that the population is closed (e.g. the number of errors is constant) - this can also mean that the population is both closed and “well defined” (e.g. the two proof-readers have the same version of the text), (2) all errors are equally catchable by both proof-readers, (3) detected errors can be matched, and (4) detection of an error by one proof-reader is not influenced by the detection of the same error buy the other proof-reader. This is, I think, more stringent than two simple random samples mentioned above (that would cover (2) and (4) only). It may be easy (I have my doubts) to meet these assumptions in the context of proof-reading but is very difficult in epidemiological applications. In my experience, capture-recapture studies are often flawed (all of mine have been!). It is then a matter of identifying violations of assumptions and their likely effect in terms of the magnitude and direction on the final estimate. Schnabel, Z. E. (1938), “The Estimation of the Total Fish Population of a Lake”, American Mathematical Monthly, 45, 348–352. which proposes an extension to the Petersen method using cumulative marking using a single mark (i.e. no need for multiple marking or different marks for different testers). Good summaries of abundance estimators for capture-recapture data can be found in many textbooks. Krebs’ “Ecological Methodology” is well regarded.